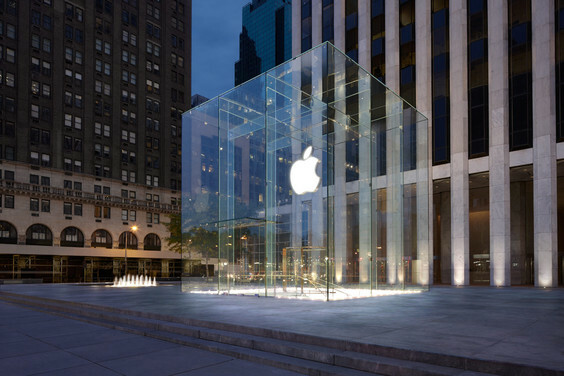 Apple has been granted a patent for the design of its iconic glass cube Fifth Avenue retail store, reports Patently Apple. The decision comes four years after Apple applied for a trademark related to the store's design, which is still currently pending. The panted granted today was originally filed on October 15, 2012 and credits eight inventors including former Apple CEO Steve Jobs. Apple's Fifth Avenue store opened on May 19, 2006 and was designed by architectural firm Bohlin Cywinski Jackson. Due to a structural overhaul that took place in 2011, the location currently uses 15 panes of glass as opposed to 90 used in the original cube. The renovations on the newer cube also did away with nearly all of the hardware that previously held the original panes together, resulting in a "seamless" design. If I'd designed and engineered it I'm pretty sure I wouldn't want anyone else copying it too. They patented a glass cube?! Oh dear, someone doesn't understand the difference between an idea and an implementation..
By your logic Star Trek owns pretty much everything technological that has come out in the last 30 years, and also the next couple of decades too. This thread is about to be filled with comments from people who have no idea what a design patent is. It's such a cool store. According to Forbes, it's the most photographed site in NYC. It's normal for tourists to visit architectural icons in cities they visit. People visit cathedrals too, but it doesn't mean they have to convert. If they never I could guarantee you Samsung stores would have the exact same architecture (their interiors are almost exactly the same already). Dumb. Patents are being granted way to easily. This does not deserve a patent. Most things that are being patented should be denied. The whole system is abused. Time to simply end patents. You have no idea what you are talking about. First, patents are in the US Constitution...good luck ending them. Second, there are different types of patents. This one is a design patent, and this is exactly what it is for.